This set wants to convey drama. Its setting is the stage, its scenery the customary ruins of Italian crèches, and the actors strike poses of reverence and submissiveness. They are clothed in flowing robes, indicating wealth and refinement for the magi, and decently covered shabbiness for the others, the Holy Family and the lone shepherd. In the wings are standing more actors waiting their turn to enter the scene. The backdrop reaches far into a landscape painted in colors of chiaro-scuro, suggesting a battle between darkness and light. The main pointer for this Christmas message are the ruins. The monuments and temples of pre-Christian cultures are slowly disintegrating and collapsing. Out of their ruins are growing new life and a new culture. Growth and development will not be easy. Light and darkness will clash frequently, but the Child in the manger will be a constant measuring rod for goodness and evil. Resin figures based upon terracotta figures originally created in Sicily by Angela Tripi. 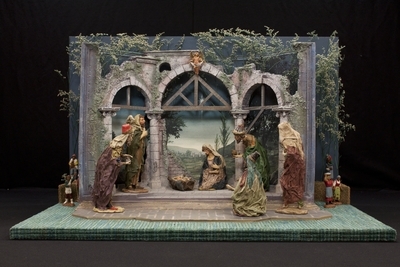 Figures include infant Jesus, Mary, and Joseph. Exhibition label originally written by Fr. Johann G. Roten, S.M. for exhibit entitled "At The Manger: No Place Like Home" held at Roesch Library, University of Dayton.